For years, focus groups have shown that individuals of all backgrounds would use bike share more with better infrastructure. Now a study with hard data is able to confirm the findings. 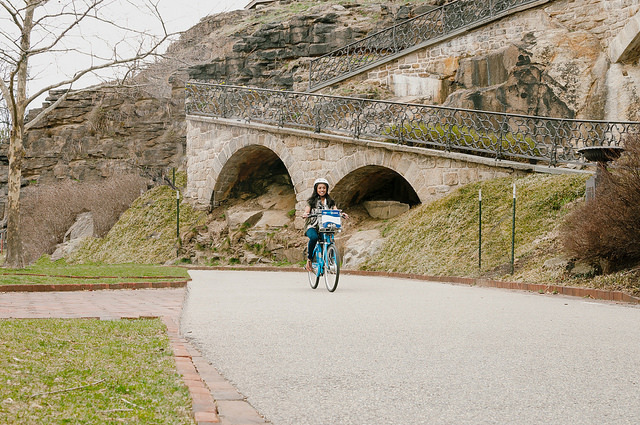 The study, conducted by Portland State University’s Transportation Research and Education Center, collected information about bicycling and bike share from residents of Philadelphia, Chicago, and Brooklyn. It’s perhaps the most comprehensive, quantitative study of bike share that’s ever been conducted, providing us with clear information on barriers and incentives to bike share use. The PSU study found that fear of being hurt or killed by a vehicle has an unequivocal and negative impact on people’s willingness to ride bikes of any kind. In the study, traffic safety fears were the number one deterrent to those considering bicycling — 48 percent of survey respondents overall said this concern was a big barrier to bicycling. Use of bike share was no exception, and the results hold true across all demographics. 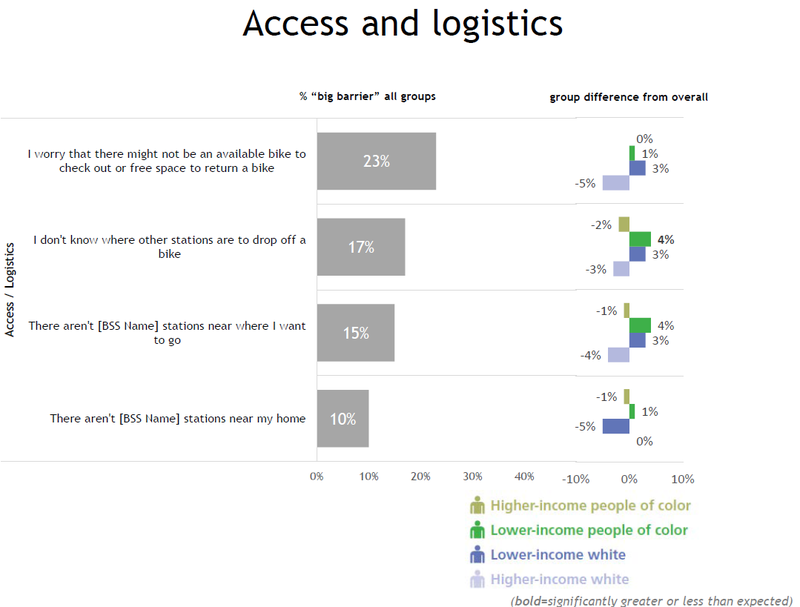 The results echo past studies showing that all people, but especially people of color say that they would be incentivised to bike if there was a physical barrier between them and vehicle traffic. When PSU researchers looked more closely at gender dynamics in the study, they saw another important data point. “We did find that women were much more likely to state that traffic concern was a barrier,” said McNeil. Prior focus groups, such as those conducted by researcher Charles Brown, also showed that women are highly sensitive to vehicular traffic safety, sometimes because they are more likely to have kids in tow. 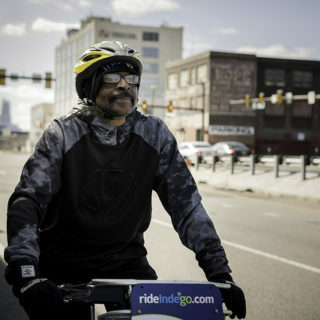 Researchers also wondered whether residents of color might be especially affected by traffic safety concerns, since they were more likely to perceive distance between starting and ending point as a barrier to using bike share. Compounding the distance issue is the problem that many low-income communities of color have worse existing cycling infrastructure. There can also be heightened fear in such communities of the social factors of safety, such as fear of being a victim of crime or harassed by police. 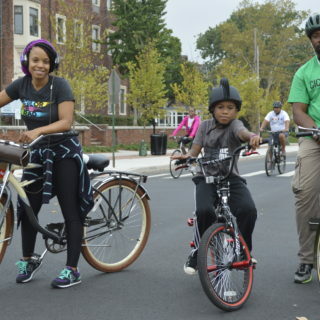 The fears surrounding traffic safety point to the importance of stronger cycling infrastructure, especially if recruiting more women and people of color to bike share is the goal. 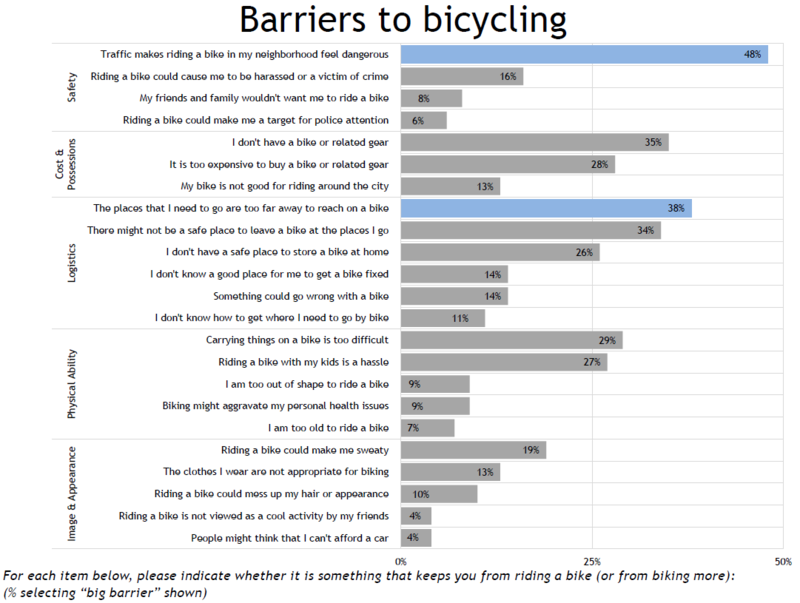 The chart below shows the percentage of respondents that answered “much more likely” to the question “Would the following changes make you more likely to use bike share?” The results show that “Help finding safe ways to get where I need to go” is important to many residents, particularly low-income people of color. To help bicyclists feel safer, building many more protected bike lanes is a start, as well as addressing the aforementioned social safety factors to bicycling. It’s worth noting that protective infrastructure should go hand-in-hand with making sure the bike share network and equipment themselves are robust. 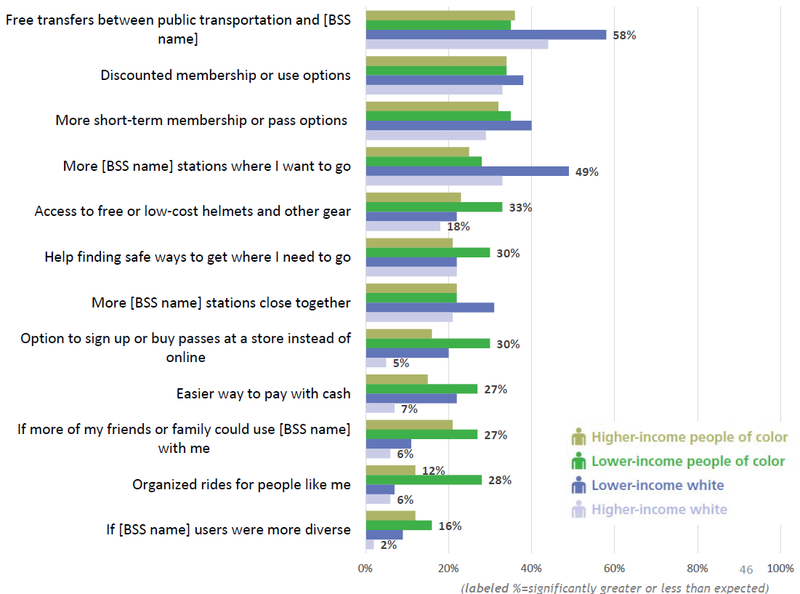 More than one in five survey respondents said that concern over being able to find an available bike, and/or fear of encountering a full dock at their destination was a big barrier to using bike share. 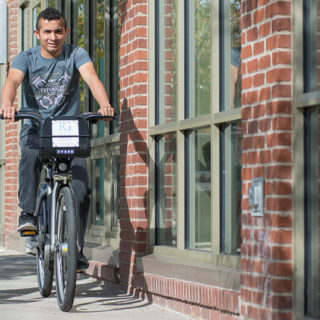 In our next series post, we’ll focus in on what survey residents do want — namely low-cost, low-liability bike share — and we’ll see how bike share systems can best make those elements a reality.